The extraordinary production by Forced Entertainment, one of the leading British independent companies. It deserves this epithet for at least two reasons, both having to do with the phenomenon of theatre time: it contains a twenty-four hour version (performen only twice) and has survived, with constant changes and modifications, for not less than 21 years (it was created in 1996). On the Prologue Day, it will be performed in its original version of six hours. There are several reasons for this decision. Due to its "age", and due to the fact that it already toured Serbia some fifteen years ago, it represents a unique return to the past, a performed note about history of the theatre in general and its own. As such, it deserves to be at the beginning, to introduce us to the aesthetic phenomenon central to the 51st Bitef, one of whose most important "founding fathers" were Forced Entertainment Company and with Quizoola! no less: the durational performance. As suggested by the title, it is structured as an endless quiz (remindful of the film They Shoot Horses, Don’t They? ), this obsession of the modern media society in which, alongside the "rotation" of actors, questions and answers to various topics generate new questions and answers ranging from personal and trivial to public, philosophical yet all, in a way, political. It is based on improvisations by splendid actors and, like all durational performances it creates a specific experience of presence and energy exchange. Quizoola! 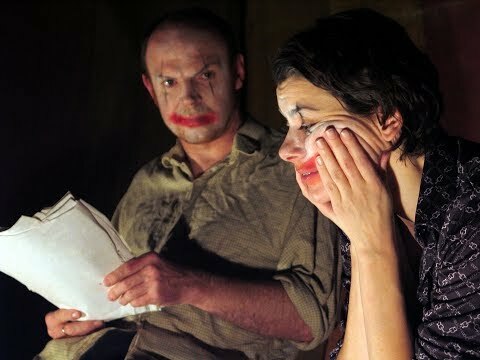 is an extraordinary improvised performance in which three performers in smeared clown make-up ask and answer questions for a continuous six hours. Dark, hilarious, absurd and intimate, it is a game that survives from moment to moment, a comical and sometimes brutal interrogation that soon gets out of hand. Set inside a circle of bare electric light bulbs, Quizoola! is a live negotiation of what is real and what is performed - of what to ask and how to answer. Quizoola! explores the need people have for knowledge, certainty and definition through language. Sometimes whispered, sometimes yelled, an answer must always be attempted to an avalanche of questions from pop trivia through personal secrets, via pub-quiz and twisted philosophical search. The audience is free to arrive, leave and return at any point as this marathon game of questions and answers unfolds. The show was originally conceived in 1996. FORCED ENTERTAINMENT is a Sheffield-based theatre company founded in 1984. Touring and presenting their ground-breaking provocative performances across the UK, mainland Europe, North America, Japan, Australia and further afield, the group have sustained a unique collaborative practice for more than thirty years. Led by the artist and writer Tim Etchells, the company includes designer and performer Richard Lowdon alongside performers Robin Arthur, Claire Marshall, Cathy Naden and Terry O’Connor. Over the years this core ensemble has been augmented by contributions from many guest artists and performers. Forced Entertainment’s work explores and often explodes the conventions of genre, narrative and theatre itself drawing influence not just from drama but from dance, performance art, music culture and popular forms such as cabaret and standup. The group operates at different scales, shifting from intimate two-performer works focused on text, to spectacular productions with large numbers of people onstage. Exciting, challenging, entertaining and questioning their audiences, Forced Entertainment have been key players in the development of a truly contemporary theatre language, and have inspired and influenced generations of UK, European and North American theatre makers. A meditation on our obsession with quizzes and game-shows… Mesmerisingly energetic... As if the entire repertoire of questions in the world were being exhausted, so that no-one outside would ever have to ask anything. A performance that changes the rule book. If art exists not to give answers, but rather to ask questions, then Quizoola! demonstrates what the right questions might be. As though life is a Quiz and we are all contestants.